Teachers are using a variety of interactive tools to introduce students to robotics. Many schools have Spheros whizzing about, programmed by students to draw shapes or perform a light show. 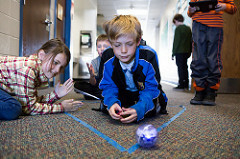 Other schools challenge students to help Beebot robots find their way through a maze, create a Cubelet creature, or write an original story for a Dash robot to perform. Schools are hosting after-school clubs for competitive robotics, in which teams develop strategies for annual challenges and then design, build, test, and compete with their own original robots. Robotics is also one way many students get introduced to coding. 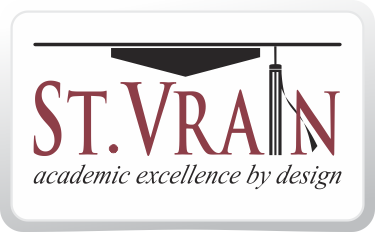 St. Vrain has produced numerous successful robotics teams over the past few years, from elementary all the way to high school. Teams have won national and world awards for BEST, FIRST and VEX robotics. Other programs in the district have students developing robotic devices for real-world clients, ranging from underwater drones to in-the-air quadcopters. That’s some serious achievement! As important as the technical side of robotics is, it’s probably the non-technical skills which students develop that matter even more. By participating in robotics, students refine their critical and analytical thinking, use creativity and innovation, and regularly apply the skills and knowledge from other classes such as writing, math, and science, to authentic learning tasks. More importantly, students build skills in communication, collaboration, project management, and more. Finally, because there are rarely easy solutions to complex robotics problems, robotics helps support students’ development of patience, persistence, and grit. If you are interested in having your student participate in any of the after school robotics offerings around the district, please contact your school for more information.